March 28, 2012 - Cessna Aircraft Company, said at the Asian Business Aviation Conference & Exhibition (ABACE) the company is seeing high levels of interest from Asia around the planned game changing mid size business jet, the Citation Latitude, scheduled to enter service in 2015. Speaking at ABACE, Bill Harris, Cessna's vice president, sales for Asia and Asia Pacific, said: "Overall demand for light and mid-size business jets in Asia is undoubtedly increasing, and we are finding customers eager for deliveries 'now' rather than later. ?We are seeing particularly high levels of interest from customers who, for example, already own or operate a mid-size Cessna Citation such as the Citation XLS+ and are planning their future purchases. The Citation Latitude represents a logical next step to a new, more advanced Citation and, like the Citation XLS+, offers a high residual value." Harris also noted the Asian market's interest in the new 15% range extension for the Citation Latitude. The specifications of the Citation Latitude have been revised to increase maximum range from 2,000 to 2,300 nautical miles (3,704 to 4,259.6km). "The Latitude offers non-stop flights between many major regional and domestic city pairs in Asia, including Beijing-Haikou, Beijing-Hong Kong and Hong Kong or Shenzhen-Seoul." Announced in October 2011, the Citation Latitude will offer Cessna's widest-yet passenger cabin with stand-up access throughout the aircraft's length of more than 16 feet. The Citation Latitude combines the payload, speed and range customers want with an unmatched cabin experience at its price point ($14.9 million in 2011 USD). Designed for a crew of two plus up to eight passengers, the aircraft will have a maximum altitude of 45,000 feet (13,716 meters) and a maximum cruise speed of 442 knots (819km/h). 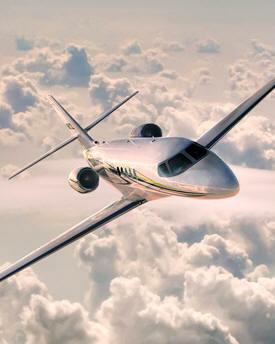 The Citation Latitude will climb to 43,000 feet (13,106 meters) in just 23 minutes. The Citation Latitude features the fully integrated Garmin G5000 avionics system and Clairity?, an intelligent cabin technology solution developed by Cessna in partnership with Dallas-based Heads Up Technologies. Clairity? ties into the avionics system and integrates cabin electrical systems with data and communication sharing through a fiber-optic backbone. Cabin systems are controlled either through intuitive touch-screen user interfaces at each seat, or customers' personal electronic devices.